I keep coming back to pages 29 & 30 in the MUFON Field Investigator's Manual, which list the equipment I will need in my Field Investigator's Kit. I keep coming back because each time I look over the list it makes more and more sense. I have to take my tinfoil hat off to the guy who compiled the list, because he very thoughtfully considered the financial wherewithal of the average MUFON Field Investigator. He actually put together three very different lists for three very different budgets. The first list, "Necessary Equipment," is for the Field Investigator who's behind on his bills. 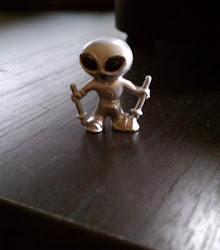 It consists of simple household products like "tweezers" and "string" and "ziplock bags" that the Field Investigator probably already has lying around the house, but which could come in handy when investigating a UFO sighting. It's basically the Dollar Store Field Investigator's Kit. 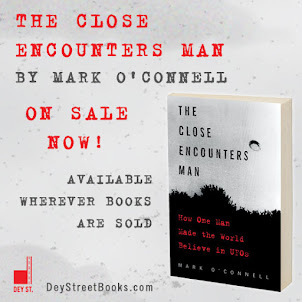 But here is its brilliance: let's say I'm interviewing a UFO contactee, and in the course of the interview it comes out that the contactee was examined by aliens and had some sort of probe inserted into his or her body, and now he or she wants it out... Suddenly the tweezers, which at first seemed kind of lame, make perfect sense! Next up is the "Desirable Equipment" list, for someone like me who has a few bucks to spend on his hobby but is acutely aware that MUFON does not have a reimbursement policy. This list includes everything from the Dollar Store list, but adds such pricey-sounding oddities as "Several 100-foot chalk lines" and "FRS/GMRS Radios." Here's where I could use some explanation. A builder uses chalk lines to lay out reference lines for walls or floors along a hard concrete surface. So if I happen to investigate a UFO encounter at a building site, I'm expected to lend a hand laying out the building as I interview the witness? Help me here, MUFON. At the top of the pyramid is the "Optional Equipment" list, the Cadillac of equipment lists for the MUFON One-Percenters. Here we find all sorts of "-ometers" for measuring magnetic fields, light levels, radiation levels, distances, weather conditions, ground density, and all sorts of other things that can make or break a UFO investigation. Trouble is, many of these devices cost a boatload and "require a trained specialist to operate correctly." 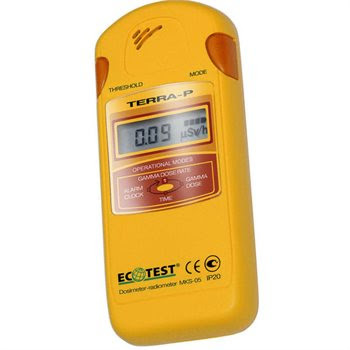 Apparently I will need a Geiger Counter like this when I am called upon to interview a radioactive UFO witness. It costs over a thousand dollars and requires special training. My first thought was: why do the rich Field Investigators get all the fun stuff? Then I read the list again and realized that I'd rather not have to purchase and operate a Geiger counter, thank you very much. What good can come of that? First of all, I think it's a bit silly to think that UFOs or aliens are nuclear-powered. That would be a bit like a bloke from the 1850's encountering a Saturn V rocket and assuming that it runs on whale oil. Second of all, why would MUFON expect me to expose myself to radiation? I say, if it glows it blows. You won't get me and my tweezers anywhere near that investigation site. The only thing I need in my equipment ziplock is a dime to call in the STAR Team. NOTE: Phone calls used to cost a dime.